Customization is something we love to do, from logo'd truffles to custom ribbon, and even creating exclusive sweets flavors to represent your company or event. We can offer discounts to our corporate clients starting at $1000. Please fill out our request form to receive a quote from our confectionista. If you can see this, you have javscript turned of, and we apologize, but we need you to put the word TRUFFLE in the text box to verify that you're human. If you want your clients to ooh and aah the moment they see your gift, look no further. Our micro-batch artisan sweets are renowned for our fun, twist-on-traditional flavors that are unique yet approachable. Local ingredients are the star of the show: we use grass-fed cream from Illinois, exclusively local berries and stone fruits, and Illinois wildflower honey replaces corn syrup. We work with all budgets to create seriously cool gift packages. We wrap our gifts sans basket, packing in even more delicious treats. Custom branding is always a hit, whether it's logo'd hang tags or custom truffles. 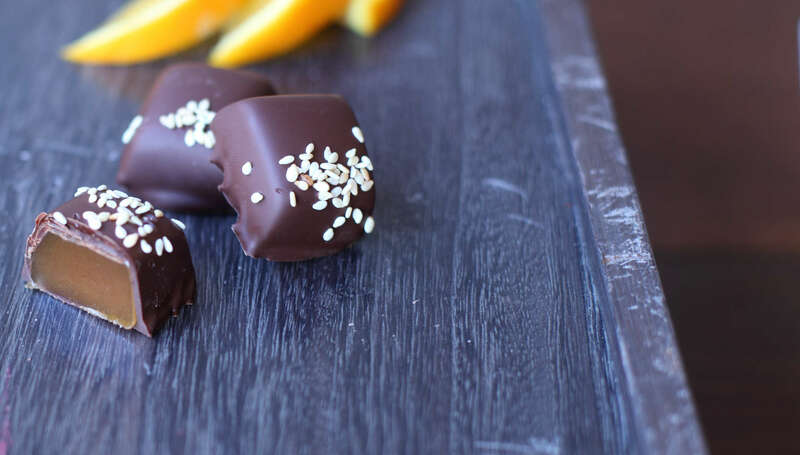 A beer distributor sending beer-infused truffles? Unforgettable! Ask what we can do for your company. Simply select a package and send us your spreadsheet. Your client will receive our treats packed with loving care, including our signature hand-tied satin bows. Satisfied clients include PNC Bank, The Chicago Cubs, and Walgreens. 7pc truffle box, 5pc fleur de sel caramel, pillowy marshmallows. Drinking chocolate mix, pillowy marshmallows, 4 piece truffle, 7 ounce caramel. 20 piece truffle, 14 ounce caramel. 20 piece truffle, 14 ounce caramel, 14 piece chocolate dipped sea salt caramels. 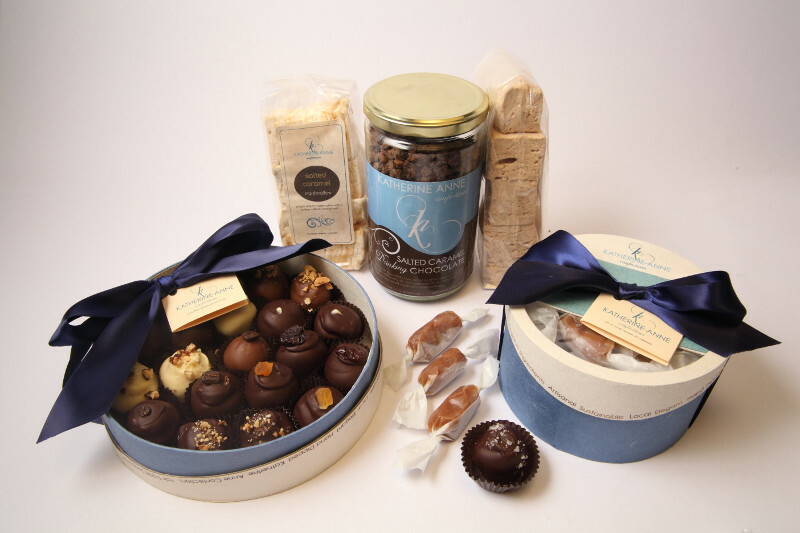 One glorious box of our best-selling truffles, caramels, and marshmallows encompassing our favorite sweets. Includes 1 pound of caramels, 14 truffles, pillowy marshmallows and our seasonal s'more. 20 piece truffle box, 14 ounce caramel box, drinking chocolate mix, pillowy marshmallows, 5pc chocolate dipped sea salt caramel tray. 20 piece truffle box, 14 ounce caramel box, drinking chocolate mix, 2 flavors pillowy marshmallows, 14 piece chocolate dipped sea salt caramel box, 2 seasonal s'more. 2x 20 piece truffle box, 2x 14 ounce caramel box, 2x 14 piece chocolate dipped sea salt caramel box, all 4 flavors of our award-winning drinking chocolate, all 6 flavors pillowy marshmallows, 2 4oz artisan chocolate almonds, 5 seasonal s'mores, roasted almond toffee, peppermint bark. Bring our famed drinking chocolate to your next wedding or corporate event! Named one of the Best 15 in America by Fodor Travel, this luxuriously rich drink is made with local milk and cream from Kilgus Farms, and real chocolate (no cocoa powder). We provide several flavor options such as our salted caramel and Mexican spice blend, with our house marshmallows and infused whipped creams. The finishing touch is a garnish bar, featuring 10 house-made toppings like candied hazelnuts, crushed candy canes, sea salt, toffee, and more. "One of the best 15 Hot Chocolates in America"
Please contact Katherine at 773-727-3248 or hello@katherine-anne.com to request a date.